Emily Barryman rides the last part of the "Street Ride"
What a great event the Public Safety day was. Fire engines, police cars an ambulance and Sparky the firedog made for an exciting day and at the end there was even a chance to climb the tall fire truck ladder. 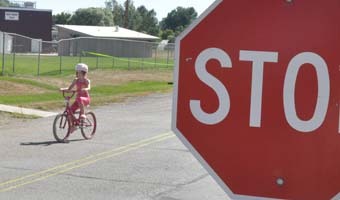 The intent of the event was to keep the kids safe as they ride their bicycles to school and back. Trooper Villavicencio, Colorado State Patrol Child Safety Technician was there with is 150 mph cruiser and the kids were in awe of all the equipment inside. Berthoud Fire was on hand to display their equipment and make sure kids have a bicycle helmet. 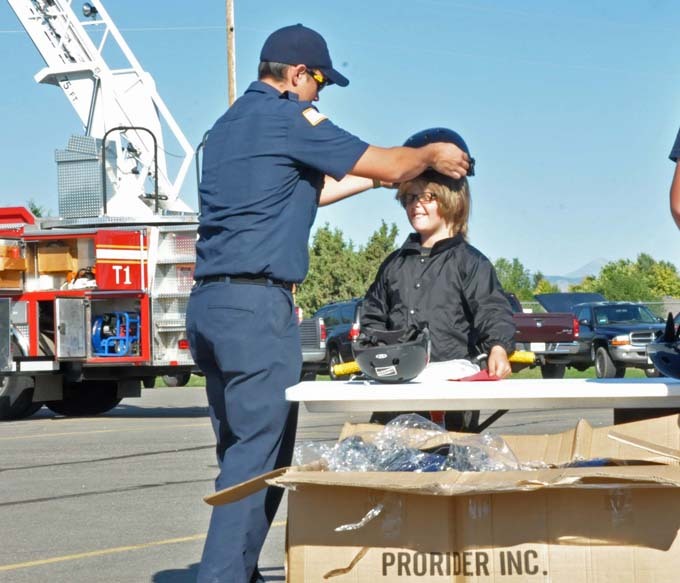 The free bicycle helmet is an ongoing program with the Berthoud Fire Protection District, and if you missed safety day you can still go to the BFPD Station #1 in Berthoud to be fitted for a helmet. The department is also one of the few places that does cars seat inspections. After having their helmets checked, the kids stopped by the Peloton Cycle table to have a check-up on the bicycle. Jerry and Max from the Loveland shop brought their tools, made necessary adjustments and a thorough check of the bicycle, and put air in the tires before sending the kids on their way. Next stop was the “Rules of the Road” where Benjamin Zink had more pages of rules set out than you could read in a half hour, so he explained some of the more important ones, like the necessity of signaling and how it was done on a bicycle. With all this information in their heads, it was time to put it to the practical test in the Bike Rodeo where all the events were designed to reinforce the safety rules the kids were learning. The seven events in the rodeo were worth up to 10 points each with the winners to receive trophies at a future town board meeting. The first event was “Stop.” Three stop signs and a stop mark to test being able to stop in the right place. Next was a “fast as you can” to the edge of the pavement and then see how far you can “Coast” on the grass. The “Slow Race” was designed to teach balance at slow speeds. Points were deducted for putting your feet on the ground. The “Figure 8” required making two circles and staying in the lines. This tests control and maneuverability. In the “Paper Boy,” the riders had to toss newspaper into tubs from ever increasing distance. The “Street Ride” had several stop signs and a cross walk. The kids had to stay on the correct side of the road, make hand signals and dismount to cross the street. The final event was the “Obstacle Course” with cones to slalom through, and obstacles to ride around and bridge to cross. The volunteers certainly had to show up early to paint all the lines that clearly marked the course for the kids. Josh Berryman said he had a fun time and learned a lot. He had been riding on the wrong side of the road and now he knows to use signals. The kids enjoyed the morning, though turnout was a little less that the organizers had hoped. Perhaps next year they could offer free sno-cones to entice more riders. The first step in safety is proper equipment. Firefighter Nick Ireland fits Phillip DiPentino with a new helmet. 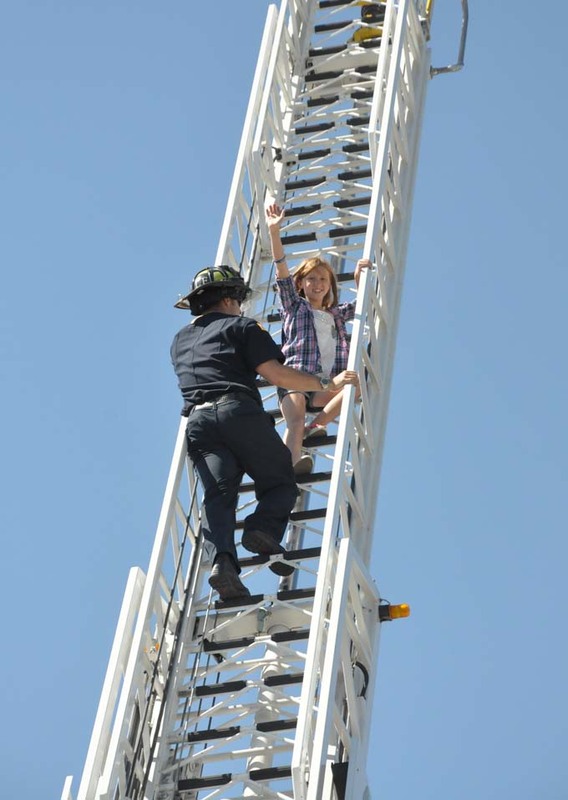 Emily Cavey was The first to climb the fire ladder. She went up again later and went all the way to the top. Site contents copyright © 2019 Recorder Online	except as noted. All rights reserved. | 147 queries in 2.496 seconds.